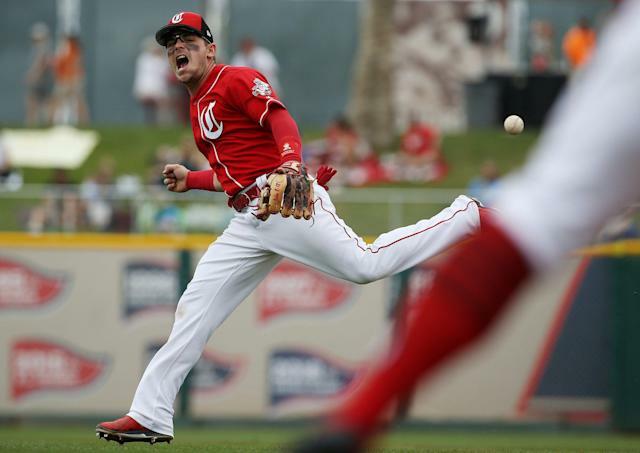 Cincinnati Reds All-Star second baseman Scooter Gennett will miss 2 to 3 months after suffering a right groin strain, the team announced Saturday. The injury occurred during Friday’s spring training game against the Milwaukee Brewers, and it happened under unusual circumstances. Gennett appeared to lose his footing after fielding a ground ball in short right field. Gennett completed the play by throwing the runner out at first base from his knees, but needed assistance leaving the field. Fans nearby reported that Gennett appeared to mouth “it popped” when Reds athletic trainer Steve Baumann arrived. Gennett was taken out of the stadium moments later on a golf cart. The timing couldn’t be any worse for Cincinnati with opening day five days away. Gennett has been the Reds best hitter not named Joey Votto over the last two seasons. His breakout 2017 season included a rare four-homer game. He followed that with an All-Star campaign in 2018. He's posted a .303/.351/.508 slashline with 50 total homers and 52 doubles over those two seasons. His presence will definitely be missed for as long as he's out of the lineup. The injury also came just hours after the Reds demoted top prospect Nick Senzel in controversial fashion. In a hard-hitting statement, Senzel's agent claims the Reds are manipulating the league's service time rules in a bid to control Senzel for an extra season. Though primarily a third baseman, Senzel has second base experience and would be a logical candidate to fill in for Gennett. The Reds could end up shifting José Peraza to second base and insert José Iglesias at shortstop.